This title will be auto-delivered to your Kindle on 15 May 2019. "Because of Ken Napzok and this book, we can sound like we know what we're talking about on our Star Wars talk show." 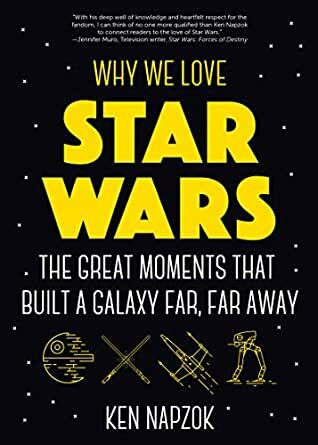 - Stephen Ellis and Alex Backes, Black Series Rebels "Reading this book I discovered that Ken not only has the beard of Obi-Wan Kenobi but also the storytelling flair of C-3PO, and he had me hanging on his every word like an Ewok. This is the Star Wars book I've been looking for." - Jamie Stangroom, director - The Empire Strikes Door. Why We Love Star Wars is THE book for the Star Wars fan... the new fan, the young fan, the old fan, even the fans who have yet to discover the magic. Ken Napzok reminds you, again, of the magic of Star Wars discovered as a kid and later, put into practice as an adult. Its dissection of themes, its playful ability to expand on what you already know, and its capableness to teach you even more proves this is the quintessential book on Star Wars. It also reinforces one truth: Star Wars is for everyone. - Mark Reilly, writer/ producer/ host of The Reilly Roundtable.